Invisible Death on sale now at Audible! 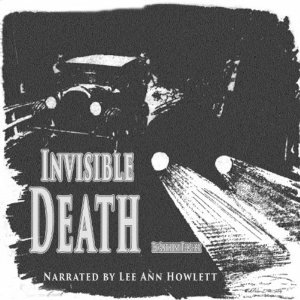 A science fiction short story Lee Ann recorded, Invisible Death by Anthony Pelcher, is now for sale on Audible. Darius Darrow, a brilliant scientist and inventor, died suddenly and violently in his home laboratory while his chemist wife, Susan, was nearby. No one was seen entering or leaving the home during the crime. The perpetrator stole Darrow’s latest invention while committing the murder. The police and the head of the company who paid royalties on some of Darrow’s patents begin the search for his killer. Death threats in the form of letters sent to the company head begin arriving after the murder demanding money or warning there would be more killings. What had Darrow invented that someone would want badly enough to kill him for it? The recording may be purchased here. Posted by lahowlett on February 5, 2014 in Uncategorized and tagged Anthony Pelcher, Audible, audiobook, Invisible Death, Science Fiction, short story.